Simostronomy: Two Eclipses, an Occultation and a Meteor Shower All At Once! Two Eclipses, an Occultation and a Meteor Shower All At Once! As many of you probably know, Wednesday, in the early morning hours before dawn is the peak of the annual Perseid meteor shower. The meteors are dusty remnants of the comet 109P/Swift-Tuttle that are trapped by Earth's gravity and burn up as the plunge through the atmosphere. The all appear to be coming from a point in the constellation Perseus, which is how they got their name. You may also see occasional meteors from two lesser showers that are also active; the Delta Aquarids and Kappa Cygnids. These move noticeably slower than Perseids, and their paths seem to originate from different constellations, so you should be able to tell them apart. Meteor watching doesn't require any equipment at all. It is the perfect naked eye astronomy activity. Find a spot with an open view of the sky, wrap up warmly in winter clothes or a sleeping bag, lie back in a lounge chair and watch whatever part of your sky is darkest. Even though the Earth will be traveling through the thickest part of the comet debris on Wednesday morning, a few days either side of the predicted maximum will still yield higher than normal hourly counts of meteors. This is a good thing, because on Friday morning in the hours before dawn several other interesting and bright astronomical phenomena are happening at the same time. 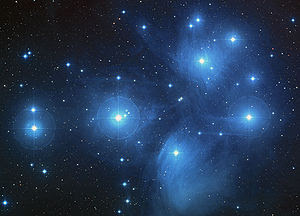 The Moon will be crossing the path of the Pleiades star cluster. 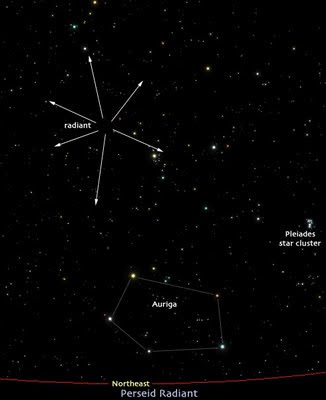 Even though the Plieades is a naked eye cluster, this event will best be viewed with binoculars or a telescope with a wide field of view. As the morning hours turn to dawn you can witness the sunlit side of the Moon passing in front of several stars in the cluster as it moves across the sky, and you'll see stars reappearing on the other side as the Moon moves away from them. This is called an occultation. Its fascinating to be able to actually see the Moon's motion across the sky as stars get closer and closer to the edge of the Moon and then suddenly disappear from view. As if the tail end of a meteor shower and an occultation of a star cluster weren't enough, you can also witness the eclipses of two famous eclipsing binary stars on this same morning. The first is Algol, also known as beta Persei and the Demon Star, in the constellation Perseus. Algol fades and rebrightens like clockwork every 2.87 days. Its variations are obvious to the naked eye. In the middle of an eclipse it shines dimly at magnitude 3.4 instead of its usual 2.1. Algol will be at minimum at 3:30am EST (7:23 UT) also. Algol stays nearly that faint for two hours. It takes about four hours to fade to minimum, and again to brighten to maximum. So if you start observing Algol around midnite, you will be able to see it fade from maximum brightness to minimum in one night. Saturday night it will be back to maximum as if nothing had happened. And finally, in the same part of the morning sky lies epsilon Aurigae. Epsilon Aurigae is an eclipsing binary also, but its eclipses happen very infrequently. In fact, they only occur once every 27.1 years! The entire eclipse takes about 600 days from start to finish, so you won't be able to watch the whole thing happen Friday morning, but you can make a mental note of where the star is and how bright it is, because the next time you look at it, in a week or month from now, it will not look the same. 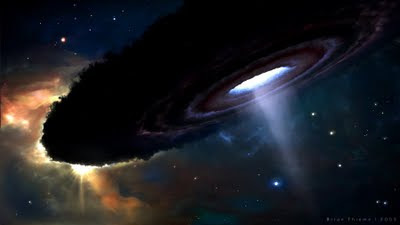 The primary star is a giant F star orbited by what we think is a giant torus shaped cloud of dust and gases, that may or may not have one or two stars in its center. There is much we don't know about this spectacular enigma. This absolutely awesome image of epsilon Aurigae was created by Brian Thieme. Epsilon Aurigae is the subject of the largest citizen science project ever undertaken. To learn more about this mysterious, baffling star, and how you cna contribute to science by observing it, visit the Citizen Sky website. With any luck, the skies overhead at your house will be clear this coming Friday morning, so you can watch astronomy happening in real time right before you eyes.